This post contains affiliate links.This article may contain affiliate links; there's a possibility I could earn income when you click through one of these links and sign up for an account, make a purchase, etc. This article is written for entertainment purposes only and should not be construed as financial or any other type of professional advice. Motif Investing is an online brokerage firm with a unique approach to investing. The firm allows me to invest according to themes and big ideas, which the firm calls motifs. A motif may contain up to 30 individual stocks or exchanged-traded funds (ETFs). A motif could conceivably be comprised of randomly selected stocks. But the concept underlying this method is that I can invest according to a theme, which may represent a type of company, such as businesses engaging in online gaming; an investing strategy, such as corporations with strong cash flow; or another idea, such as companies that serve either the poor or very rich. I can build my own motif or choose from the firm's catalog of motifs created by professionals or members of its investment community. Through the trading platform at Motif Investing, I can buy multiple stocks in a motif for the price of a single transaction. Compared to most online brokerage firms, this bundling of stock purchases is a great deal. Let's say that I am excited about the growth prospects of pharmaceutical companies, such as Johnson & Johnson, Pfizer, Eli Lilly, and the rest listed as the top 12 pharma corporations by annual sales. But I'm not sure which companies' stocks will perform the best over the coming years or maybe I think they all will perform exceptionally. So, I decide to buy shares in all of them. I build a motif comprised of these 12 stocks and purchase the motif for $9.95. If I had purchased the stocks individually through an online brokerage firm like E*Trade, Fidelity, Schwab, or TD Ameritrade, then I would have paid up to $119.88 (12 trades x $9.99 per trade). From this perspective, the flat trading fee offered by Motif Investing is very attractive. An alternative to this pharma motif might be a health care sector or pharma industry mutual fund, such as Vanguard Health Care Fund Investor Shares (VGHCX) or Fidelity® Select Pharmaceuticals Portfolio (FPHAX). Notably, these funds are not exact replicas of my proposed pharma motif. But I can buy and sell shares of these funds at no cost. Still, the advantage of the motif approach compared to a mutual fund or ETF purchase is that I can choose which companies to include as well as their weightings in the motif. Plus, (unlike an actively managed fund), I can control when I sell individual stocks within the motif, rebalance the portfolio, and acquire new stocks. Finally, I won't pay management fees that are standard with traditional mutual funds. To invest with Motif Investing, I must open and fund an account. Then browse through its catalog of motifs and/or build a motif filled with stocks or ETFs of my choice. Each motif can contain up to 30 stocks or ETFs. I can buy a motif as designed or make adjustments to the motif. I can change the weightings of individual stocks from an allocation by market capitalization to an equal weight among all stocks or a custom allocation of my choice. Further, I can add or delete stocks as long as I have at least one holding and no more than 30 stocks. The account minimum is $250 plus any trading costs ($9.95 per motif purchase, rebalance, and sale). However, in some cases, I may need more in my account to place a trade on stocks with lower volume. I noticed this nuance when I created a motif last year and had to wait for prices to go down before my trade could be executed (however, this turn of events boosted my returns). Typically, the fee is $9.95 to purchase a motif. This price is similar to the flat trading fee to purchase just one stock at many online brokerage firms. Within each motif, I can trade individual stocks for $4.95. If I decide to make changes to the motif or rebalance the motif, the transaction charge is $9.95. Occasionally, Motif Investing offers deals in which I can buy specially designed motifs for free or rebalance the motifs at a lower-than-usual trading cost. In addition, the firm runs promotions that reward new customers and customers making referrals by adding money to their accounts. Notably, there are some fee-free motifs: Commission-free Horizon motifs , which are comprised of market index funds (ETFs); these motifs give investors diversified portfolios based on investing time horizons and risk tolerance. When I sign in to my account, I see “Your Investing DNA” under my name and below my profile. When I click on that tab, I'm taken to a survey. There I can answer questions that include my age, retirement date (or time horizon for invested funds), and investing interests and values. The survey delivers results that include a suggestion for allocating funds among Horizon Motifs (index funds) and specialty motifs (individual stocks). For example, the survey results indicated that I should put 80% of my money in an asset allocation motif called Horizon Motif: 15 Year Moderate and 20% in specialty motifs. A couple of the motifs suggested were Used Car Tune-Up and Cleantech Everywhere based on my interests in consumer basics and renewable energy. I can explore Professional Motifs and Community Created Motifs through various search methods. Apply filters to the motifs based on investing style, idea theme, etc. just as I might apply a size and color filter on an apparel shopping site. For example, I can select New and Interesting and discover motifs that include Fighting Ebola and Wearable Tech. Or I might choose Cultural as an Idea Type and find Socially Responsible and No Glass Ceilings (companies who have female CEOs) motifs. When I select an individual motif, I get lots of information and views that can be customized. In the Overview section, I can read a description of the motif plus see its components of segments (sectors) and individual stocks. At a glance, there is the motif's year-to-date return, its most recent one-year return, and its performance compared to the S&P 500. For each segment and stock, I can view its percentage of the total motif, current (or closing) price, market capitalization (number of shares times share price) or dividend yield, and one-year return or one-month return. I can also create custom views from the View > Details Table. For example, I can add the P/E ratio, Price, 1 Year, and 10 Year performance. I can sort the columns to see what stocks have grown the most in the past year, have the lowest valuation, and pay the largest dividend. Further, I can tap the social feature of Motif Investing and see what other members think about a motif and indications of whether investors purchased a motif “as is” or made custom adjustments. I can build, evaluate, and tweak a motif using Motif Investing's tools. Clicking on Build a Motif and following the prompts guides me through the process of naming and describing the motif, and adding stocks. After the initial construction, I can evaluate the motif and make adjustments. Though Motif can't predict future performance, it can backtest the performance using different scenarios. For example, I built a motif of several financial companies; Motif Investing grouped and displayed the various stocks within the motif and showed me the previous year's returns. I noticed that one of the companies had a relatively low return and a high P/E valuation, making me think that this particular stock may not perform well in the coming year so I removed it from this motif. After making adjustments, I can finish the motif and purchase shares during the current session or a later time. In general, a more experienced and sophisticated investor might like Motif Investing the best. Such an investor may love perusing the catalog and discovering motifs that match what she (or he) believes will perform strongly in the coming months. For example, someone may be excited about investing in businesses that deliver services related to digital security in light of the data breaches among major retailers and become intrigued by the Cyber Security motif. Newer and less experienced investors may be attracted to the Horizon Motifs, the firm's index funds that are allocated among domestic and international stock and bond ETFs. These are available at no cost, as long as the investor doesn't customize the motif (that is, don't change the weighting of the ETFs, delete any ETFs, or add stocks or ETFs to the original design). Further, less experienced investors may benefit from the community feel of the site and the depth of information that is easily accessible. There's information about investing and stock selection, available by viewing various motifs, the methodology of selecting stocks for the motifs, and technical details about various stocks (such as their P/E ratios, market capitalization, and dividend yields). 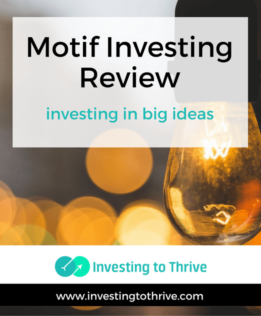 Generally, investors of all experience levels may choose Motif Investing to have fun with their investments plus try out novel investment ideas and (possibly) generate market-beating returns.